Dreco, a purgative, is advertised as a Spanish flu preventative, “better than a cure.” The 4th Liberty Bond Drive is struggling to meet its goals in the face of peace proposals. WF French, Mrs Anna Adams’ small daughter, Mr and Mrs RC Birmingham, Malloy Barnes, Jack Scott and his small daughter, Ada McCormick, Alfred Britt, Jb Edwards, Mrs Leonard Phipps and her infant, are reported dead from influenza and pneumonia in Lumberton, NC. 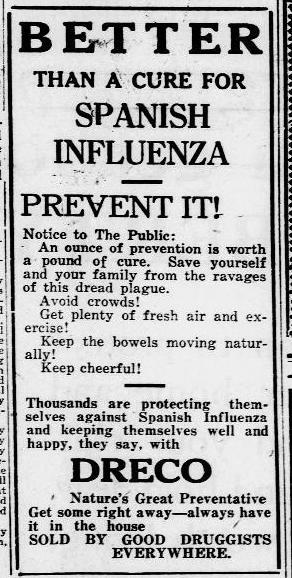 Source: “Better Than A Cure for Spanish Flu,” The Robesonian, Lumberton, North Carolina, October 14, 1918. Page 5, Column 4.